Carrying a heavy hose, two firemen rush to the scene of a fire, directing water onto the flames. 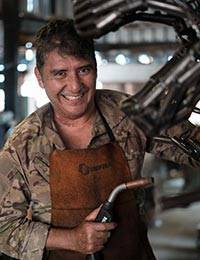 Armando Ramírez fashions the fire fighters from spark plugs and recycles a chain for the hose. An old automobile pulley, galvanized wire and metal bits left from a die cutter finish the figures.